Toshiko passed away peacefully at home on November 1, 2018 at the age of 99 years, just three months shy of her 100th birthday. She is survived by her loving family, including daughters Aiko (Roy) Asao, Lillian Terada and Lucy Brown, her grandchildren Kim Asao, Stacey (James) Seib, Deane, Steve and Nikki Terada, great grandchildren Kaili and Koby Terada and Sola Seib and several nieces and nephews. She is predeceased by her husband Jim Hiromu Shirai, sons-in-law Mas Terada and Bud Brown, sister Etsuo Chiba, brothers George, Tom, Harry and Mutsuo Chiba. 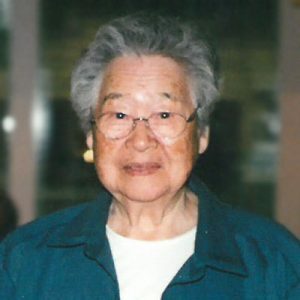 Toshiko was born January 30, 1919 on the Dunwater Estate, Fintry, BC. When she was 3 years old, her family returned to Japan. At the age of 15 she came on the Hei Maru ship to Vancouver, BC and a train ride to Vernon, BC, arriving on June 18, 1934. On November 3, 1936 she married Jim Hiromu Shirai. They had 3 daughters and lived on the Shirai family farm located on Brookside Ave. and Gordon Rd. in Kelowna, BC, currently locations of Millbridge Park and A.S. Matheson Elementary School. Toshiko loved having a large vegetable garden and growing many types of flowers including a big collection of orchids. She was always busy cooking and doing a variety of craft projects over the years. A Graveside Service will be held Thursday, November 8, 2018 at 12:00 pm at the Kelowna Memorial Park Cemetery, 1991 Bernard Ave, Kelowna, BC, with a Celebration of Life from 1:00 pm – 4:00 pm at the Kelowna Golf and Country Club, 1297 Glenmore Road, Kelowna, BC. Flowers and Koden gratefully declined. Thank you to Drs. J Tisdale, W. Wickstrom and R. Swart and their staff. Special thank you to Aiko, who was Toshiko’s full-time care giver during the last couple of years. The service for SHIRAI, Toshiko is scheduled for A Graveside Service will be held Thursday, November 8, 2018 at 12:00 pm with a Celebration of Life from 1:00 pm - 4:00 pm. Below you will find the map for the service location and the contact information should you have any questions. So sorry to hear of your loss. Condolences to all family and friends. May she forever rest in peace. Our sincere sympathies to the family. a grand age and may she be at peace keep the memories of a lifetime…..Charlie & Eleanor. Terrace. B.C.